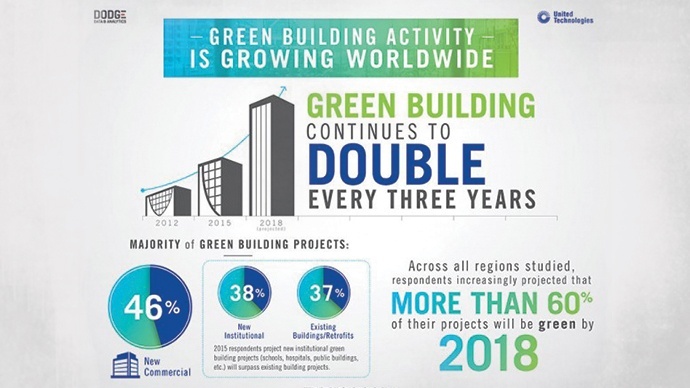 Clients and tenants worldwide are increasingly demanding sustainability – for both energy efficiency and occupant benefit — and green building continues to double every three years, according to the World Green Building Trends 2016 report by Dodge Data & Analytics. The findings of the report, which received funding from United Technologies, were presented by Bob McDonough, President, UTC Climate, Controls & Security at the recent 2015 Greenbuild International Summit in Washington, DC. For complete article and full study results on RealStreetTech.com, click here.